Among the flurry of groundbreaking technologies making headlines in the health care community, augmented reality (AR) may be one of the least discussed. However, AR has gained a lot of traction in the general media. Additionally, researchers at Cincinnati Children's Hospital used AR with a C-arm to create a virtual fluoroscopy system.7 Preprocedure, the radiologist performed a cone beam CT and planned a trajectory, which was synced into the system. The C-arm automatically adjusted so that the skin entry point would allow a "down the barrel" approach to the target. The needle was advanced to the planned depth, and a confirmatory cone beam CT was performed. Not all radiology-related papers were procedurally based. A paper by Douglas et al described converting a breast CT data set into an "immersive 3D environment. "8 The "system provides a separate image to each eye with head tracking, ability to rotate, translate, zoom, and converge the eyes to a particular focal point, change intraocular distance, and display fly-through viewing of the image datasets." Further research may elucidate instances in which a true 3D virtual environment may provide additional diagnostic information. A benefit cited by many authors is improved safety profiles due to the ability to visualize traditionally "invisible" anatomy via holographic representations superimposed on surgical anatomy. One way this is achieved is by avoiding dangerous vascular anatomy that can't be seen directly. Also, in a paper by Bourdel et al, authors discuss the importance of minimizing surgical incision numbers and dimensions while performing myomectomies to decrease the risk of complications including adhesions.9 According to the authors, AR supplementation allows surgeons to virtually visualize myomas while selecting their approach and incision site, minimizing the need to "explore" down to the target. The relative novelty of the technology does have several limitations. The most cited limitation is difficulty in real-time predictive modeling of target tissue given anatomic deformation and mobility during surgery. The authors described how "the software calculates patient thickness and tracks in real time [15 frames per second] the patient positioning and patient motion." These new data, according to the authors, have the potential to empower technologists to optimize appropriate framing and dose settings as well as notify them when there is active motion that would degrade the images. 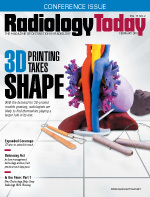 Given radiology's expertise in data and imaging, it seems to be a natural evolution for the specialty to harness this next generation of imaging to maximize imaging quality, supplement image-guided procedures, and assist clinical colleagues. — Daniel A. Ortiz, MD, is a chief radiology resident at Eastern Virginia Medical School. He serves as the president of the American Alliance of Academic Chief Residents in Radiology, vice chair of the ACR's Resident and Fellow Section, and the Washington, D.C., community manager for 3DHeals, LLC. — José Morey, MD, is a senior medical scientist for IBM Research, a visiting assistant professor in the department of radiology and medical imaging at the University of Virginia, medical technology and artificial intelligence advisor for NASA iTech, chief engineering counsel for Hyperloop Transportation Technologies, a member of the Health Informatics Leadership Council at the VA, and director of informatics for Medical Center Radiologists in Virginia Beach, Virginia. 1. Pan A. Pokémon GO has made $1.2 billion in revenue. Game Rant website. https://gamerant.com/pokemon-go-revenue-1-2-billion/. Published 2017. 2. Statt N. Apple shows off breathtaking new augmented reality demos on iPhone 8. The Verge website. https://www.theverge.com/2017/9/12/16272904/apple-arkit-demo-iphone-augmented-reality-iphone-8. Published September 12, 2017. 3. Fritz J, U-Thainual P, Ungi T, et al. Augmented reality visualization with use of image overlay technology for MR imaging-guided interventions: assessment of performance in cadaveric shoulder and hip arthrography at 1.5 T. Radiology. 2012;265(1):254-259. 4. Fritz J, U-Thainual P, Ungi T, et al. Augmented reality visualization using image overlay technology for MR-guided interventions. Invest Radiol. 2013;48(6):464-470. 5. Marker DR, U Thainual P, Ungi T, et al. 1.5 T Augmented reality navigated interventional MRI: paravertebral sympathetic plexus injections. Diagn Interv Radiol. 2017;23(3):227-232. 6. Fritz J, U-Thainual P, Ungi T, et al. MR-guided vertebroplasty with augmented reality image overlay navigation. Cardiovasc Intervent Radiol. 2014;37(6):1589-1596. 7. Racadio JM, Nachabe R, Homan R, Schierling R, Racadio JM, Babić D. Augmented reality on a C-arm system: a preclinical assessment for percutaneous needle localization. Radiology. 2016;281(1):249-255. 8. Douglas DB, Boone JM, Petricoin E, Liotta L, Wilson E. Augmented reality imaging system: 3D viewing of a breast cancer. J Nat Sci. 2016;2(9). 9. Bourdel N, Collins T, Pizarro D, et al. Augmented reality in gynecologic surgery: evaluation of potential benefits for myomectomy in an experimental uterine model. Surg Endosc. 2016;31(1):456-461. 10. Hekman MCH, Rijpkema M, Langenhuijsen JF, Boerman OC, Oosterwijk E, Mulders PFA. Intraoperative imaging techniques to support complete tumor resection in partial nephrectomy [published online May 12, 2017]. Eur Urol Focus. doi: 10.1016/j.euf.2017.04.008. 11. Rouzé S, de Latour B, Flécher E, et al. Small pulmonary nodule localization with cone beam computed tomography during video-assisted thoracic surgery: a feasibility study. Interact Cardiovasc Thorac Surg. 2016;22(6):705-711. 12. Liu WP, Richmon JD, Sorger JM, Azizian M, Taylor RH. Augmented reality and cone beam CT guidance for transoral robotic surgery. J Robot Surg. 2015;9(3):223-233. 13. MacDougall RD, Scherrer B, Don S. Development of a tool to aid the radiologic technologist using augmented reality and computer vision. Pediatr Radiol. 2018;48(1):141-145.